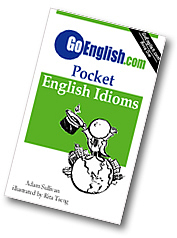 Today's Idiom = "A Fool And His Money Are Easily Parted"
A "fool" is a person who is always joking and doing stupid things. "A fool and his money are easily parted" means that it is easy for a foolish person to lose his money. In this idiom it is "a" fool and "his" money that are easily parted. Example: "How is it that you left home with 20 dollars but you come home with nothing? A fool and his money are easily parted!" If you spend money carelessly and are cheated easily then you are a fool. "A fool and his money are easily parted" says that a foolish person ("a fool") is easily separated ("parted") from his money. Example: "Her husband can't seem to hold onto any amount of money; he either spends it or loses it. A fool and his money are easily parted."